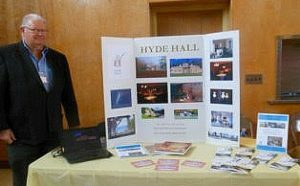 Hyde Hall participated in the second annual history fair organized by the Otsego County Historical Association on Saturday, April 23 at the Springfield Community Center. Twenty-two Historical societies set up their booths. It was an opportunity to show the progress in the restoration of the Hyde Hall Historic Mansion and to discuss the new carpet in the Drawing Room. Designed by David Hunt of the Vermont Custom Rug Company and manufactured by the Langhorne Carpet Company of Penndel, PA, this carpet will recreate the kind of floor covering once found in many of the mansion’s principal rooms, including the Front Hall and the Dining Room. 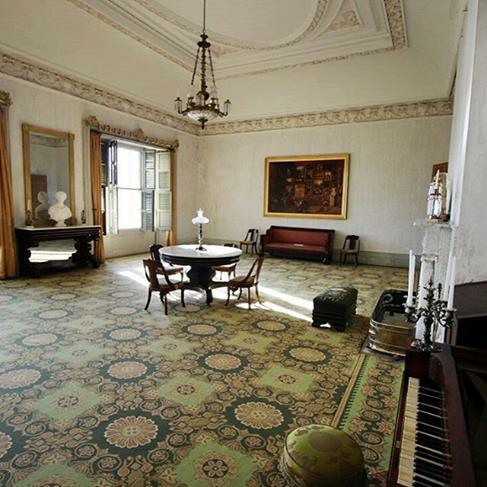 In the early 19th-century, Brussels carpets, which have a looped pile construction, were typically installed in the homes of America’s most wealthy citizens, including presidents and major landowners.